The Department of Art and Art History announces that long-time graphic design instructor Laura Lineberry will retire in December 2018. 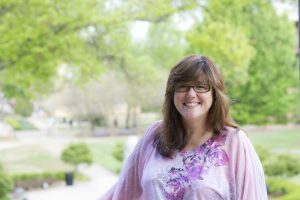 A UA alumna, Laura Lineberry has been a full-time instructor in digital media and graphic design since 2006. She was an adjunct instructor of graphic design from 2000 to 2006. Before Lineberry began teaching, she worked in Marketing Communications at the Capstone for nineteen years, including as art director, graphic designer and illustrator, giving her more than three decades as a member of UA staff. She has won numerous local, regional and national graphic design awards and guided many students to win awards as well. Her colleagues and students will miss her positive energy and enthusiasm and wish her well. Lineberry has taught hundreds of students over the years, several going on to successful careers. Most recently, Laci Jordan has become nationally recognized for her design and illustration work in Forbes, Essence, New York Times, to name a few. Olivia West, who now designs in national theme parks and other large-scale projects with Universal Studios started out in graphic design and digital media. Over the years, Lineberry has consistently been recognized for excellence in her field and for her service to the community. She has won dozens of national design awards including Platinum and Gold Marcom Creative Awards. She won four Best of Show awards from the American Advertising Federation Tuscaloosa’s annual American Advertising Awards (ADDYs), most recently, in 2017, for her “Christmas Card” project. She also won a Gold ADDY and a Silver ADDY in 2017. Lineberry’s work for UA’s Alumni Magazine and her role in the branding architecture for UA were rewarded with AAF Tuscaloosa Silver ADDYs in 2016. Lineberry is a board member of several civic organizations and charities including Sister Cities International, Easter Seals of West Alabama and Friends of the Drish House, and is a past board member of the West Alabama Chamber of Commerce Women’s Division, Family Counseling Services and T-Town PAWS. She has been recognized by several organizations for her community service, including two different awards from the Junior League of Tuscaloosa. She served as faculty advisor for the Honors College student-run publication Mosaic Magazine, which won AAF Tuscaloosa’s Best of Show (student division) in 2014. Lineberry is an alumna of the UA College of Communications, where she received her MA in advertising and public relations, with a cognate coursework in art education. She majored in studio art with a minor in art history at Florida State University, and post-graduate work toward a teacher’s certificate in art education at Troy University.